Desk top essential – keep it by your workspace and mist liberally throughout the day to help protect against the blue light emitted from digital devices. Refresh and boost concentration during those inevitable slumps. Frequent flyer status – pop it your bag to help protect against airborne germs & keep skin hydrated & nourished. Same goes for your daily commute! As a traditional toner – use in place of your toner, post cleanse and pre-serum. Spritz onto a cotton pad & gently sweep over skin to remove the last traces of cleanser. Not just for the ladies – as a unisex product, Digital Detox is a simple and effective way to keep men’s skin healthy. This line was created as a response to the ever growing need for products that address the issues we face on a daily basis. We find it is less relevant to just talk about skin types, but more the challenges of modern living. One of our main concerns being the impact of both digital and environmental factors on both our skin and wellbeing. 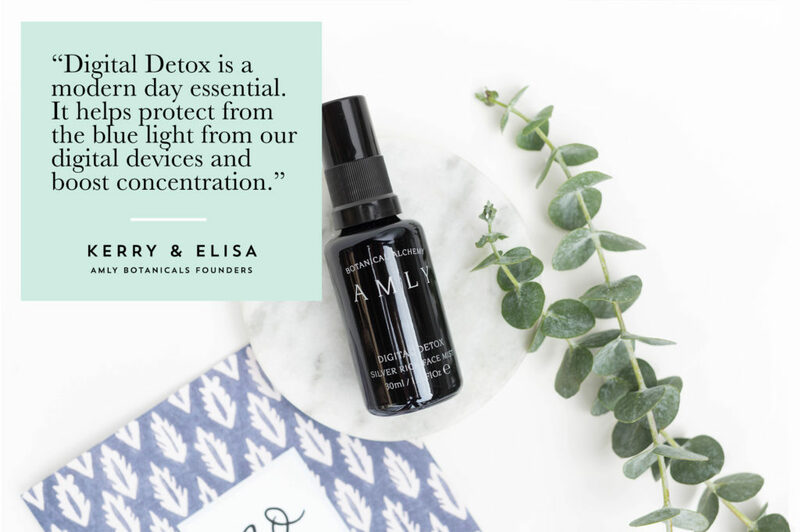 The Digital Detox goes a long way to keeping skin protected, hydrated & clear throughout the day, this combined with our complex blend of hydrosols & essential oils helping to re-energize & boost concentration. What is the ingredient formulation process? The formulation process for all our products is a complex and lengthy one, both Digital Detox and City Screen taking nearly 8 weeks. The spring water used in the mist comes from beneath our organic wildflower meadow in Sussex. With both products, our targeted botanical extracts, essential oils and hydrosols are hand blended. The hydrosols are produced with hydro distillation, a traditional process which extracts natural oils from the flower or bark into water. This method as opposed to steam distillation ensures all the essential properties of the plant/flower remain intact and we capture the whole essence and the holistic benefits they bestow. The formula then has to be succussed (shaken vigorously) to distribute the energy of the hydrosols through the water, then rested. This is repeated several times to allow ingredients to reach the optimum level of synergy.